Two Injured In Crash Involving Tractor Trailer On Beeline Highway In West Palm Beach | Schuler, Halvorson, Weisser, Zoeller & Overbeck P.A. A serious crash involving a semi and tow cars injured two people on the Beeline Highway at Northlake Boulevard. The Florida Highway Patrol said the motor vehicle accident happened after a 36-year-old West Palm Beach driver failed to stop his 2008 Sedan car and struck the rear of a tractor-trailer that was stopped at a red traffic light. The rear-car collision caused the car to spin out of control, hitting another vehicle ahead. FHP says two people were injured in the crash. The nature of their injuries was not indicated. Reacting to the crash, the FHP spokesman said the crash was as a result of traveling at a high speed. He appealed to drivers to obey traffic laws; speed limits and to be mindful of other road users. The crash remains under investigation. The rear-end car accident hampered traffic for several hours and is still note cleared up, authorities say. It is advisable to avoid this route and to take alternate routes. According to National Traffic Safety Bureau, rear-end car accident is one of the most common types of automobile crashes in the country. It is also the leading type of personal injury accident. Attorney Jason Weisser of Schuler, Halvorson, Weisser, Zoeller and Overbeck responded about the crash. “Cases involving accidents with commercial trucks are always subject to heightened scrutiny because of the additional regulations placed on drivers of those vehicles. 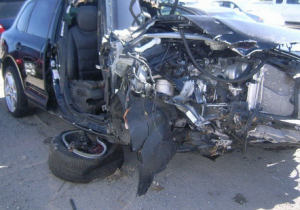 It was reported in this case that the driver of the car that was speeding and failed to stop caused this accident. Hopefully the investigation reveals all of the facts about this accident. Please be careful anytime you are behind the wheel of a car, truck, or motorcycle and obey the speed limit. If you have been injured in an accident, call my office for a free consultation to find out what are your rights”.